SPECIAL ANNOUNCEMENT! 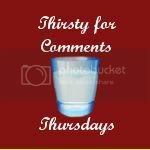 We are looking to add one or two new Co-Hosts to Thirsty For Comments! All of the HTML is written and shared each week, so all you have to do is post... and participate!!! If you're interested, please email Heather!